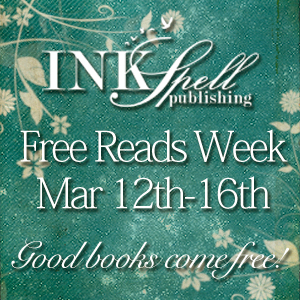 This week, from March 12th to March 16th, InkSpell Publishing is organizing a Free Reads Week. That means that you can read free short stories by some of the InkSpell Publishing authors. On March 12th, you can read Forever Yours by Shilpa Mudiganti, the author of contemporary romance novella Always You. In Forever Yours, main character Amelia loves Aaron, her fiancé. But she also loves Damon. Can one be in love with two men at the same time? How do you define infidelity? Or fidelity? On March 13th, InkSpell releases Love, Lies and other Disasters, a contemporary romance short story by Cecilia Robert, the author of Truly, Madly, Deeply You. In Love, Lies and other Disasters, the one person Celina fought so hard to get over five years ago is back, and has kidnapped her. He says he wants a second chance to prove his love. Will she allow him to glide back into her life and heart? On March 14th, you can read Beyond The Hidden Gate by Debbie Peterson, the author of paranormal romance novel Shadow of the Witte Wieven. In Beyond The Gate, Aynia doesn’t remember anything, save her name. Can Aeden help her remember who she is, the love they shared and the importance of the quest for which she risked her life? Or will the power of an evil warlock shatter all they hold dear? On March 15th, InkSpell releases yet another contemporary romance short story, this time Coming Together by Naya Nikki, author of Familiar Ties. Life is complicated when you are pregnant at 17. But when the father doesn’t know and he’s marrying another right in front of you, it is bound to break your heart. What does Ellie do? Cry on her daughter’s shoulders? Last but not least, on March 16th, author Stephanie Lawton’s short story After Taste will be released. In After Taste, nothing can shield him from the horrible dream. Nothing can protect her from a danger she can’t see. If you want to read these mix of romantic, tense and suspenseful stories, then head over to the InkSpell Publishing website. And there’s more. Not only is InkSpell Publishing handing out free short stories to their readers, they’re also organizing a contest at the end of the week. Participants in the contest need to answer one question from each story correctly, and in return they can win a $10 Amazon Gift Card and an InkSpell novel of their choosing!